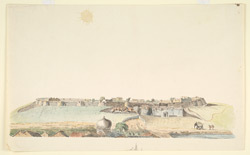 Water-colour painting of the fort of Bangalore, from a village outside the main gate by an anonymous artist, c.1790 - 1792. Bangalore Fort was originally built out of mud by Kempe Gowda, a feudatory chief of the Vijayanagar Empire and the founder of Bangalore city. In 1761 the fort was reconstructed in stone by the Raja of Mysore, Haidar Ali (c.1722 - 1782) and was an important stronghold during his reign and that of his successor and eldest son, Tipu Sultan (1753 -1799). The fortress was built in an unusual oval shape with eight gates, only one of which survives today. Bangalore fort was captured by Lord Cornwallis and his army on 21 March 1791 after a fierce battle during the 3rd Mysore War 1791-1792.